The news of the get together came after a long week of work and a day of soccer and yard work. My wife and I argued a bit about how lame it would appear if only she and the kids went, but in the end she threw up her hands in frustration. It’s not that I dislike our friends; quite the opposite, I enjoy their company…in appropriate doses. This is what Pat means in her article: introverts are in their stride when they don’t force themselves (or others) to be more extraverted. When they do what comes natural. She gives spending time with her pets, reading, and spending time with a few friends as activities more to introverts’ liking. I decided that night that what I wanted to do was stay home to be alone. If one of the kids wanted to stay home that would be fine. But if my wife and they wanted to go to the get together, that was fine as well. None of them wanted to stay home with me, so I was on my own…and in total bliss. You may wonder what I did that night. First I ordered a pizza, which I ate in our living room, without guilt. Then I searched On Demand for a movie I wanted to watch. The one I chose was about a man in search of his sister who was seriously injured in Brazil. He was a Kung Fu super hero who killed many people without being scratched. The movie sucked, but I watched the entire flick. After the movie I ate my favorite evening snack, cereal. Then I did what makes being alone so enjoyable for me; I read one of my Joe Nesbo novels. 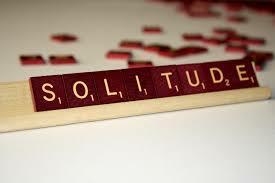 A times I wondered what my family and friends were doing, but I was grateful for the solitude. I imagined what I would be thinking at the get together when 10:00 p.m. rolled around. Probably I would want to leave after having a great time catching up, while my wife would want to stay until 12:00 or longer. I also imagined the resentment I would feel and wishing that we had taken different cars. Further I thought how ridiculous it would look if I left the gathering alone. There he goes, they would think. What’s wrong? Does he dislike us? Maybe one or more of our introverted friends would think how nice it would be if he could also leave, their time being extraverted expended like mine. Sophia Dembling, author of The Introvert’s Way: Living a Quiet Life in a Noisy World, writes about how she’s not a huge fan of parties because her energy wanes, just like mine. I enjoyed reading this part of her book, related to it completely. This is the lot us introverts are dealt when our energy level wanes and it’s time to bolt the scene. We’re perceived as aloof, when in fact we enjoy being with people as much as anyone. Just not for an extended amount of time. Unlike extraverts, who feed on being with people, introverts enjoy the occasional bouts of solitude that allows us to recharge our battery. When my wife woke up in the morning, I sheepishly asked her what explanation she gave our friends for my absence. She said with a smirk, “I told them you’re an adult.” This gave me a great sense of pleasure, and I vowed I’d make the next get together. I’m already bracing myself for that night. This entry was posted in Career Search, Introverts and tagged Alone Time, extraverts, Intoverts, Parties, Solitude on September 24, 2014 by Things Career Related. Although the music is noticeable and people at the table in front of me are chatting and laughing, I’m happily engaged in one of my favorite activities, writing. I’m unfazed by the noise from the music and people as I sit in a plush chair in my favorite coffee shop. The people and music are more like white noise than a disruption. It’s as though I’m alone. You could say I’m in the zone. The introverts’ ability to be alone, even in a loud setting, speaks to their ability to concentrate on the task at hand. We introverts simply block out those around us. Some may see this as aloofness or even snobbishness. But it’s none of these; we just refuse to be distracted. Extraverts, who are drawn to people, may not demonstrate the same discipline; they thrive on stimuli and are more aware of their surrounding. Not me. I’m alone. My alone time is about to be disrupted. A man sits down next to me and after a few minutes wants to talk about the Red Sox’ World Series win; and I would gladly discuss the momentous event with him, but not now. I’m friendly, so I respond to his greeting and comments but quickly return to my writing. It becomes obvious that he wants to talk more about the World Series, despite my obvious hint—I think it’s a clear hint. Maybe two minutes of conversation will be enough to satisfy this interloper, I reason. Two minutes pass and soon it approaches five minutes. Then I start to feel annoyed with this man who wants nothing more than to talk baseball. He launches into Big Papi’s MVP award, followed by the duck boat parade he wanted to attend but had to watch on TV with his wife, who kept asking about the various players. The conversation seems more like an obligation than a mutual discussion. My feeling of annoyance soon turns into the uneasy feeling of being trapped; after all, I didn’t ask for this conversation. A simple “hi” and a comment or two about the World Series would be fine, but to launch into a full-fledged conversation is ruining my focus, unlike the music and chatter that seem like they’re in the distance. When you see someone so focused that his eyes drift not from his computer screen, leave well enough alone. He’s probably taking advantage of what small amount of alone time he has. 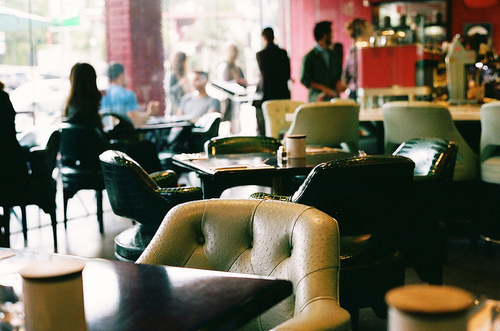 We like human contact, but at times we want to be alone, even if it’s in a crowded coffee house. It’s one of our pleasures which you, as stimuli-driven individuals may not understand. Conversation is not about you. If the other person is not engaged, it’s a sign that the person is not interested in the conversation. On the other hand, a welcome response signals a two-way conversation. It’s obvious that I won’t get anything done with this person to the left of me talking incessantly, so I turn to the person who is sitting to my right, my adorable daughter, and ask, “Honey, are you ready to go?” Together my daughter and I leave the coffee shop, and on the way home she asks me who that annoying guy was. Just someone with bad timing I tell her. This entry was posted in Career Search, Introverts and tagged Alone Time, introversion, introverts, writing on November 6, 2013 by Things Career Related.